Worked for 17 years in the grocery department of Farnworth and Kearsley Industrial Co-operative Society. In 1913 he entered the iron foundry business with his father and three brothers. At one point the business encompassed two foundries in Farnworth and two others in Little Lever and Pendlebury. He was first elected as Councillor in 1928. Alderman. Resigned 1957. In his capacity as Chairman he had the honour of receiving from Lord Derby the Charter of Incorporation, creating the town a Municipal Borough. War broke out during his Chairmanship and he had hoped that the War would be brought to a victorious conclusion during his Mayoralty. 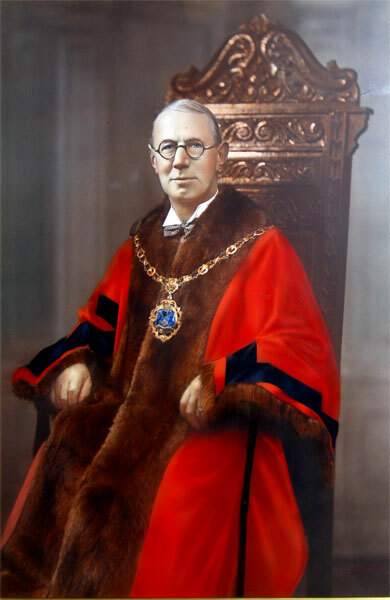 At his installation as Mayor he said that he had always been interested in politics, municipal work, the Cooperative movement, trades unionism and the general uplifting of the life of the working classes. It was a great honour to be Chairman but an even greater honour to be Mayor. As Chairman he was only responsible to the Council, but as Mayor he was responsible to the whole community and the connecting link between the people and the Council. He opened the children's nursery at the Poplars, Park Road, for children up to five years of age whose mothers were employed on War work. He was responsible for both the institution of The Aid to Russia Fund, which raised £1000 and for The Red Cross Fund. He possessed great organizing ability and was an extremely keen worker. During his period of office it was said "he was not able to expand himself as he might have done in times of peace but had fully justified himself with dignity and had shown an unbiased wisdom in the chair." He was awarded an OBE in 1950 in recognition of public services. He was Vice-president of the Employment Exchange Committee and President of the Farnworth NUDAW Branch and the Co-operative Society Board. He was President of the Farnworth and Kearsley Charity Bowling Handicap Committee and President of Farnworth Operatic Society. He was a member of the Farnworth Literary Society and a Governor of Bolton School. Congregationalist - he had a lifelong connection with Albert Road Congregational Church. 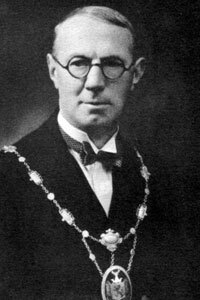 Formal portrait of Alfred Jones as Mayor of Farnworth.